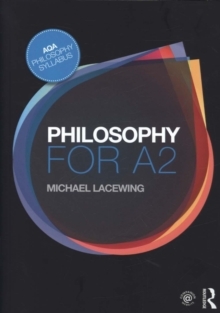 Philosophy for A2 is an engaging textbook for the new AQA A2 Philosophy syllabus. Structured closely around the AQA specification this textbook covers the two units, Ethics and Philosophy of Mind, in a comprehensive and student-friendly way. All of the anthology texts are explained and commented on and woven into the discussion of the syllabus. With chapters on `How to Do Philosophy' and exam preparation this textbook provides students with the philosophical skills they need to succeed. Each chapter includes:explanation and commentary of the AQA anthology textscomprehension questions to test understandingdiscussion questions to generate evaluative argument'going further' sections for advanced studycross-references to help students make connectionsbullet-point summaries of each topic. The companion website hosts a wealth of further resources, including PowerPoint slides, flashcards, further reading, weblinks and handouts, all structured to accompany the textbook. It can be found at www.routledge.com/cw/alevelphilosophy.